^ James Lees-Milne describes Saint Peter's Basilica as "a church with a unique position in the Christian world" in Lees-Milne 1967，第12页. ^ 英子. 名建筑赏析：圣彼得大教堂. 《世界文化》. 2012, (08). 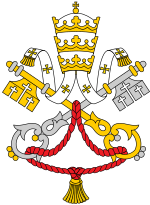 ^ Papal Mass. Papalaudience.org. [2014-04-11]. ^ Cunningham, Lawrence. Cultures and Values. USA: Clark Baxter: 671. 2010. ^ Dietz, Helen. The Eschatological Dimension of Church Architecture. Sacred Architecture Journal. 2005, 10. ^ Boorsch, Suzanne. The Building of the Vatican: The Papacy and Architecture. The Metropolitan Museum of Art Bulletin. Winter 1982–1983, 40 (3): 4–8. UNESCO website on the Holy See. Bannister, Turpin. “The Constantian Basilica of Saint Peter at Rome.” The Journal of the Society of Architectural Historians (March 1968) 3-32. Boorsch, Suzanne. “The Building of the Vatican: The Papacy and Architecture.” The Metropolitan Museum of Art Bulletin (Winter 1982) 1-2;4-64. Finch, Margaret. The Cantharus and Pigna at Old Saint Peter’s. Gesta (1991). Frommel, Christoph. “Papal Policy: The Planning of Rome during the Renaissance.” Journal of Interdisciplinary History. (Summer 1986) 39-65. Kleiner, Fred and Christin Mamiya. Gardner’s Art Through the Ages: The Western Perspective. v2. 12th edition. (Thomas Wadsworth, 2006), 499-500, 571-575. McClendon, Charles. The History of the Site of St. Peter’s Basilica, Rome. Perspecta. (1989) 32-65. Norwich, John Julius ed. Great Architecture of the World. New York: Random House, 1975. ISBN 978-0-394-49887-4. NA200.G76. [英] 凯斯·米勒. 圣彼得大教堂. 郑明萱 译. 清华大学出版社. 2012. ISBN 9787302291428. （原始内容存档于2013-12-11）. St Peter's Basilica.org ‒ unofficial website on the architecture of the basilica, with images and extracts of texts gathered from different books.